The guidance department assists students in dealing with academic decisions, college, career plans, personal problems, scholarships, and other areas in preparing students to take her/his place in our society. The guidance department is located inside the high school office. 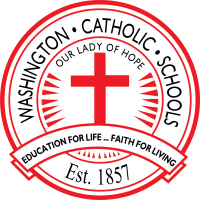 We have two part-time guidance counselors at Washington Catholic. Mrs. Mundy is available on Tuesdays and Thursdays and Mr. Engleman is available every other Friday. Our counselors provide support to all students throughout the year, and have a wealth of information that will help students plan their future. Students should feel free to make appointments with our counselors when they need advice on any problem. Parents/guardians are also welcome to make appointments with their child’s counselor to discuss concerns about their child.